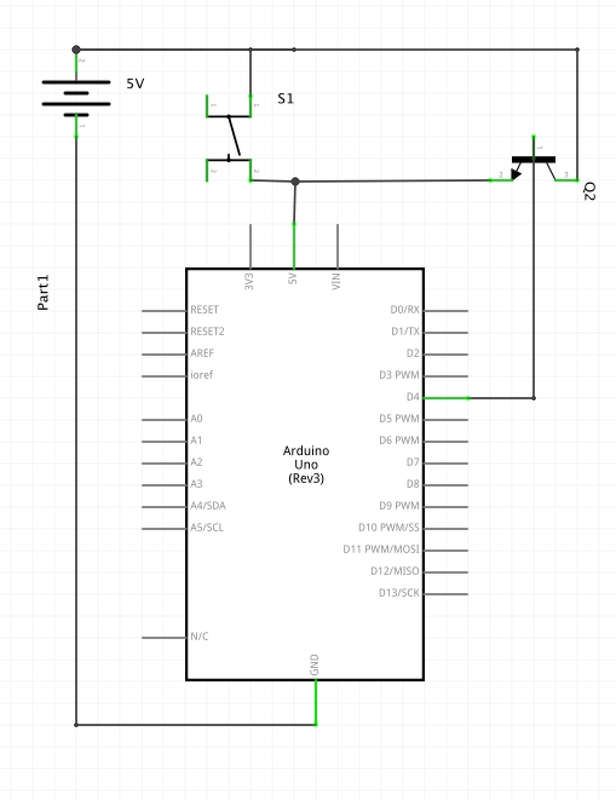 I am trying to understand why connecting, say, an Arduino digital pin 4 to a 2N4401 pin 2 as well as 5V PSU to 2N4401 pin 1 and Arduino VCC to 2N4401 pin 3, won't keep power. When shorting pin 1 and pin 3 on the 2N4401 the MCU is powered on and in-software pin 4 is set to pinMode OUTPUT and HIGHwhich should allow the 2N4401 to let power flow to the MCU for as long as power is available even when the short circuit between 2N4401 pin 1 and 3 is cut. Instead what happens when the short between pin 1 and 3 is cut, the MCU is turned off instantly. It's as if the transistor isn't reacting to the pin 4 MCU signal at all. I'm sure I lack a lot of knowledge here and I want to know how I could utilize a 2N4401 to make a SW shutdown system. Why 2N4401? Why not a MOSFET? MOSFET's circuits that do SW shutdown are available, but no transistor base SW shutdown circuits are to be found anywhere, and the 2N4401 is all that I have right now. The schematic is crap. I have no idea what you're trying to say with the dotted line between the - terminal of the the battery and the processor GND pin. The line going thru the middle of the transistor is apparently meant to be the connection to the base, but this is sloppy at best. It took me a while to realize you have the positive power connection at bottom and the ground at top. Don't do that. All these things make your schematic hard to read. Now that I've had to waste time deciphering the schematic, I'll be more brief once we get to talking about the circuit itself. You say the transistor is a 2N4401, which is NPN, but you show a PNP. Huh? Which is it? There is no base resistor. The E-B junction looks like a diode to the driving circuit. When the digital output tries to go low, it will be held one diode drop below power. That could damager the digital output or collapse the power supply. You have edited the schematic to show a NPN, but now you have a chip trying to drive itself thru a emitter follower. The switch also does nothing at all since both its ends are already shorted together. This is what you appear to be wanting... A manually operated contact (S1 in your "diagram") momentarily shorts out the NPN transistor and applies power to the Arduino. In that short time the contact is active, you want a transistor to by pass this switch and keep applying power to the Arduino so that should the contact go open circuit, power remains on the Arduino. The main problem, assuming my guess about what you want is correct, is the use of an NPN transistor as an emitter follower; whatever voltage you apply to the base will be about 0.7 volts lower on the emitter so, when the contact opens, the emitter voltage drops to about 4.3 volts to keep the NPN turned on but, that in turn leads to a drop in base voltage and quite rapidly you end up with nothing on the emitter. This one is shown at 5.5 volts on the power rail but 5 volts will be fine. It is also shown using a p-channel MOSFET instead of a PNP because the MOSFET will act as a much better "short" when activated. The "lamp" is where you connect the Arduino (aka PIC in the circuit). You will be better off with a p-channel FET though but, just in case you decide to use the PNP version you might need to lower R3 to maybe 470 ohms to provide enough base current to pass sufficient collector current to power the Arduino. You also need to have S1 wired across the "pass" transistor - at the moment you have it connected back on itself and therefore does absolutely nothing. Note that this has been fixed in the question now! Will a transistor always reduce the voltage?